Upcoming Tracfone LG L423DL Specs revealed in a user agent profile. Several days ago, Tracfone listed the LG L423DL on its official support website. 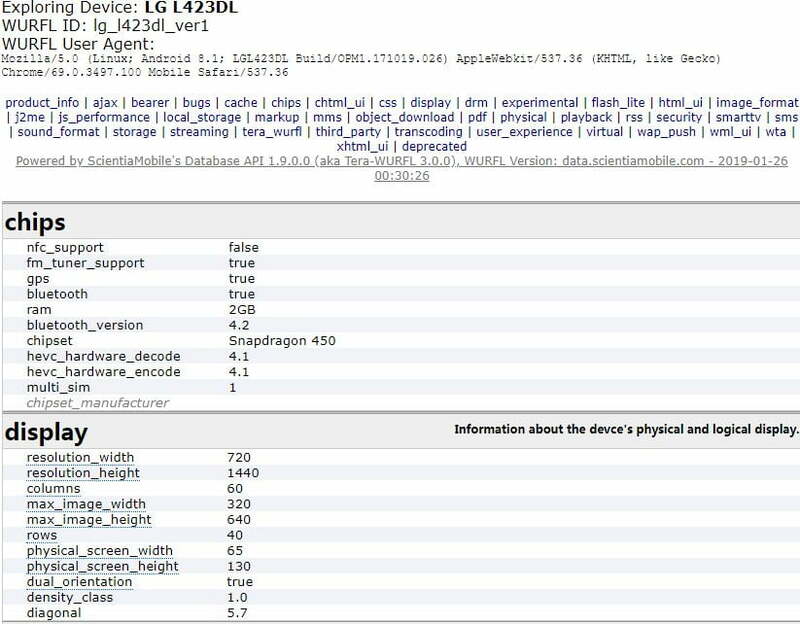 Today, a user agent profile shows up on tera-wurfl.com website has revealed the LG L423DL specs in details. As you can see from the above screenshot, The LG L423DL boasts a 5.7-inch display of 1440×720 pixel resolutions. Powered by the Snapdragon 450 chipset from Qualcomm The LG L423DL will come with Android 8.1 Build OPM1 out of the BOX. Other specs of the LG L423DL include an 8 MP Rear Camera/Video Recorder, a 5 MP Front Camera and etc. unfortunately, The RAM size of the L423DL remains unknown? Maybe it will come with 3GB of RAM. As per the GCF listings, the upcoming LG L423DL supports 4G LTE Bands 2, 4, 5, and 13. The LG L423DL could be the next generation of the L413DL which is now available as LG Premier™ Pro LTE from Tracfone? Tracfone is selling LG Premier™ Pro LTE L413DL for $79.99 only, So the price tag of the LG L423DL should be around $99. Visit tera-wurfl.com to learn more details about this new LG L423DL.